became a geographical and political boundary between North and South. Officials in the capital cities of Richmond and Washington realized the importance of the Potomac River to their defense, commerce, and communication. Maryland had not seceded, the area south of Washington was predominately pro-Southern. This part of Maryland’s economy was based primarily in slave labor and had strong ties to Virginia. Virginians hoped to use these links as a way either to persuade Maryland to secede or to recruit men from the Old Line State to fight alongside them. The link to southern Maryland was seen as crucial to Virginia and the Confederacy. As war loomed, a network of spies was created by Southern sympathizers in Washington and Maryland. Along the lower reaches of the Potomac, boats regularly crossed the river with vital information on the Federal war effort. Commerce continued across the Potomac River as Virginia and the Confederacy continued to purchase war materiel and supplies. The Federal government needed to secure the river for several reasons. First and foremost, supplying of the capital, which was exploding with thousands of newly arrived recruits, was essential. The city’s population was growing by leaps and bounds with soldiers, bureaucrats, and businessmen seeking to make money off of the war. Secondly, the river provided a communication outlet to the rest of the country and the world. The city relied heavily on river traffic. Though railroads were the dominant mode of transportation at the time, only a single track line served Washington. This line connected the Baltimore & Ohio Railroad through Southern sympathizing Baltimore. Roads and the Chesapeake & Ohio Canal were not sufficient to handle the increase in traffic and freight. Third, the Federal government and military leaders were wary of Maryland and its possible rebellion. They feared Confederate incursions into southern Maryland and the possibility of Rebel troops sent to that part of the state to bolster the pro-Southern population. This directly threatened not only the capital in Washington but also Baltimore. 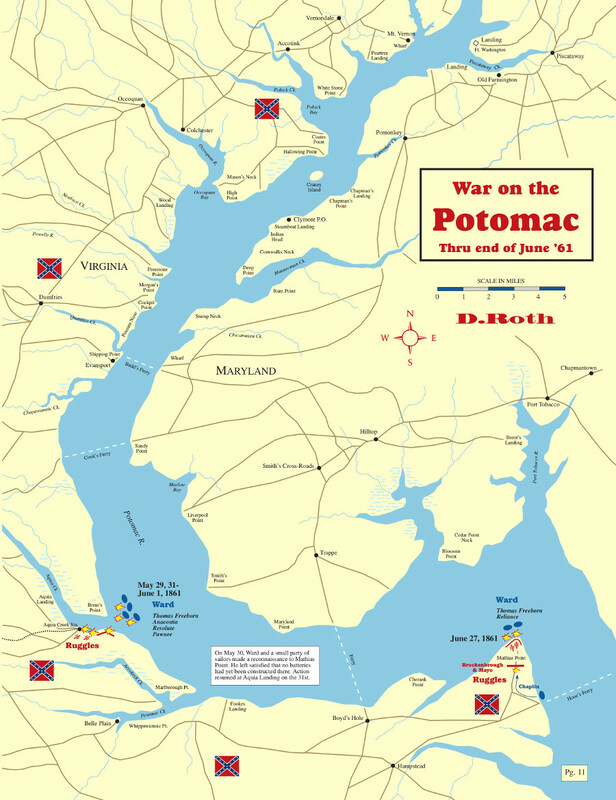 With war imminent, the Potomac River was destined to become the first battleground between North and South. What became the Confederate blockade of Washington, D. C., started on April 24, 1861, when newly minted Maj. Gen. Robert E. Lee, commanding all Virginia state forces, approved a request by the commander of Alexandria, Virginia, to destroy the light-boats and buoys that marked the channel near Washington. Since Alexandria was situated directly opposite the capital and could be easily captured, Lee decided that the place for fortifications should be located somewhere downriver. Approximately 40 miles downstream from Washington, Lee decided to build batteries at Aquia Landing. It was the northern terminus of the Richmond, Fredericksburg & Potomac Railroad where passengers had to embark on a steamer if they planned to travel up to Washington. To protect the valuable railroad station and docks, Lee turned to Massachusetts-born Brig. Gen. Daniel Ruggles to build batteries to protect the landing. 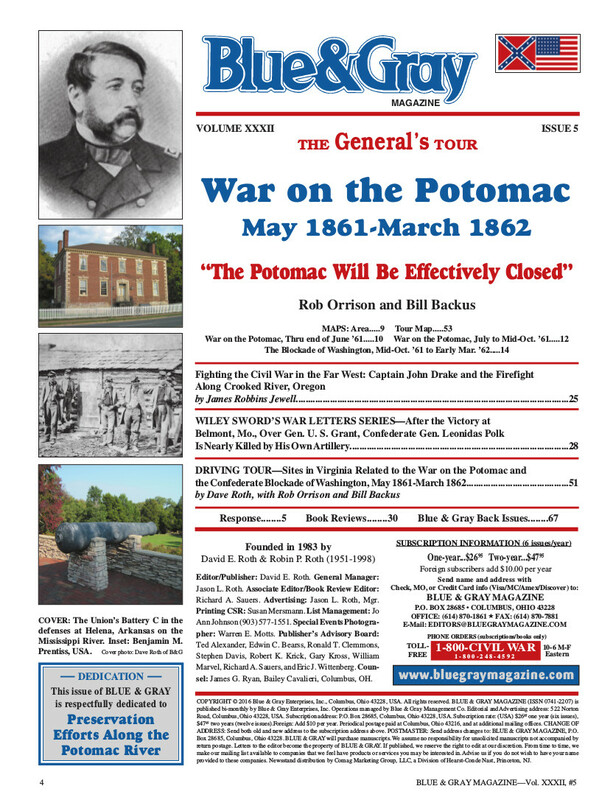 Resigning his U. S. Army commission in April, Ruggles was quickly commissioned a brigadier general in the Virginia state forces in command of the Department of Fredericksburg, which ran from Mount Vernon, near Alexandria, to the mouth of the Rappahannock River. Ruggles was expressly ordered by Lee to act on the defensive to protect the RF & P Railroad. This was because the two 8-inch howitzers assigned to his department lacked wooden carriages for the guns. Before a shovelful of dirt was thrown in the construction of earthworks, Ruggles received a hodge-podge of reinforcements to protect Aquia Landing. Most of the soldiers trickling into the Department of Fredericksburg were enthusiastic volunteers, but lacked basic military equipment such as firearms and ammunition. An exasperated Ruggles telegraphed Virginia Gov. John Letcher, “For God’s sake, send both guns and small arms and ammunition to match.” Two infantry companies from Fredericksburg, the “Washington Guards” and “Rifle Grays,” Ruggles reported as “indifferently armed, deficient in ammunition.” While the four rifled cannon of Capt. R. Lindsay Walker’s Purcell Artillery added firepower to the defenses, for over a month the battery lacked carriages, caissons, harnesses, and horses. As Ruggles waited for more infantry and artillery to arrive, in early May he received unexpected reinforcements from the Virginia State Navy. After the Old Dominion seceded from the Union, local forces were able to seize the George Page, a transport ship that belonged to the U. S. Army. The 410-ton ship was armed with two guns. Once Virginia joined the Confederacy the ship was transferred to the C. S. Navy. While the George Page later provided good service for the Confederates on the Potomac River, by May it was still being converted into a brown water warship. By May 10, the first Confederate earthworks on the Potomac River were complete. The four guns and the embrasures that surrounded them were technically part of the Confederate Navy and fell under the responsibility of Cmdr. Robert D. Thorburn. Since the Navy was still an embryonic force by this point, the guns were serviced by infantry volunteers from Ruggles’ command. Two of the cannon then protecting Aquia Landing may have been part of the bounty of materiel that was surrendered when the Norfolk Navy Yard fell to Virginia forces a few weeks before.